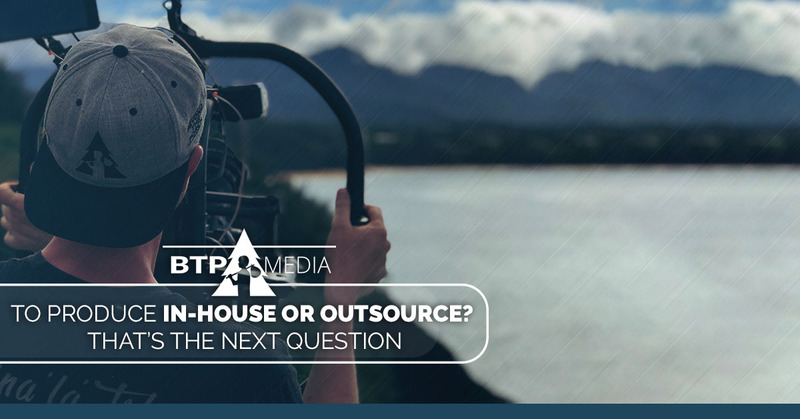 You basically have two options – hire a video production company that specializes in large-scale projects, or create a production department in your own company. In this blog, we’ll discuss the Pros and Cons of In-House production. For many companies, this is the most popular alternative because you have complete control over every aspect. You manage your own creative, costs and schedules. By creating your own mini-production company within your organization you are not at the mercy of price increases or delays due to overcapacity with your production vendor. However, there are some heavy prices to pay in developing a “good,” if not “great,” video production team. I’ve seen many video production companies try and do this on the cheap. They utilize internal staff that has always wanted to create films. They turn conference rooms and offices into mini-studios, fluorescent lights and all. They use employees as actors and add voiceovers that sound like they were recorded in a well. Basically the end product looks like it was produced on the fly, and of course, it was. Now if budget is the most important item to your organization, the above approach is your answer, but you may not get the ROI results that you’re hoping for. To create an internal studio that really works, you need to do what every professional video production company has done: hire video professionals, utilize professional equipment, shoot either on location or in a professional studio and use professional talent. I guess you’ve probably already got the point — to look professional in the marketplace, you need to produce professionally. Now this can be done in an internal department. Many companies have successfully created outstanding internal studios. The key factors on whether you should consider internal production depend on your viewpoint of the following seven items. Leadership You will need to hire, at the minimum, a Production Manager that has excelled in a large scale, professional environment. Crew You will either need to hire professionals with lighting, camera, and production experience or be prepared for a long, hard learning curve. Facility You need the space and infrastructure that will allow your crew to create professional videos. From past experience, building a minimal studio can cost at least $100,000 and please don’t minimize the cost of proper electrical and product storage capacity. Equipment You’ll have the option of either buying or renting your production equipment. It’s more convenient to own, however like any other digital device, you have to keep up with the latest software and hardware to play the game. That can be quite expensive, but renting for every shoot can cost even more. Volume From my experience, this is one of the top questions you’ll need to answer. Do you have enough volume to keep your crew busy? Remember you’re paying them for a full-time job. Or do you have more volume than they can handle, resulting in the need to outsource, in addition to the expense of an internal studio? Versatility Does your internal staff have the ability to stay on top of market trends and creative styles while in the midst of producing massive amounts of content? Budget Does your organization have the budget to not only create the department but also operate it and expand as needed? I’ve seen many organizations create a great team but then not have the resources to keep it up to date resulting in unhappy crew members that jump ship. Of course, there are many more factors that need to be considered not the least of them being the length of time it would take to create a professional department. Every day you don’t produce that product video is a day that you lose additional revenue. My recommendation is to take the above categories, make your own list and see where you come out. If you’re not up for the task, either financially or from an effort standpoint, then you might want to consider using a professional, high volume video production company. And that’s my segue for the next installment — Outsourcing Your Video Production. Stay tuned for my next blog or feel free to contact me at mike@beyondtheporch.com for a free consultation. BTP Media specializes in exceptional video productions. Feel free to peruse our portfolio before filling out our contact form! You’ll hear back from our product videography team shortly. Also, if you would like a complimentary analysis of your specific product line or video program, contact me as well. I’d be happy to see where your brand and product is at and provide you with some feedback.